“Comunicación y Hombre” is a scientific journal which belongs to the Department of publications of the Universidad Francisco de Vitoria (UFV), reporting to the Vice-dean of Research of the Faculty of Communication. It comprises an Editorial Board and another made up of qualified scientists which contribute to the development and correct management of the journal. The journal also has a team of writers who, together with the editor, carry out the administrative work and contact with the media, in this way ensuring the expansion of the scientific contents of the journal while observing adherence to its ethical code, the rules and norms for publication, the quality criteria to be respected and ensuring the originality of the texts published. The copyright and other rights and obligations are a matter handled in conjunction with the UFV’s legal department. The metrics, impact factor, ranking indexes and metadata are analysed and monitored in conjunction with the Documentation department of the UFV. All the departments and people involved in the publication procedure of “Comunicación y Hombre” are commited to safeguarding the journal’s code of ethics, and together with the authors, to respect all the rules and norms agreed upon to ensure it is adhered to. 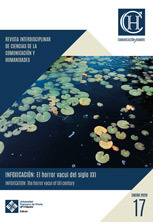 “Comunicación y Hombre” undertakes to respect the code of ethics throughout the publication procedure, through its agents involve in the different stages. The journal’s code of ethics is closely linked to the mission, vision and values of the UFV, promoting scientific research from the perspective of its main objectives, contributing to their dissemination through its publications. The journal’s director is committed, together with his team of writers, to search for research themes in the field of communication that contribute to the improvement of our understanding of human communication, with a desire to find the truth, real knowledge, to achieve greater wisdom and knowledge through the exercise of rigorous research. The director and the journalistic board are determined to ensuring total adherence to the mission, vision and values of the UFV and to expand, through its publications, the community of committed searchers for the truth and to build both national and international bridges with individuals of a similar nature and to create a respectful debate with diverse thoughts and approaches in order to guarantee healthy plurality from a culture of dialogue. , participating and contributing in meetings of the scientific committee in order to choose the themes and contents to be included, redefining the journal’s policies and strategies, as well as actively looking for new articles and authors, encouraging participation in new publications. They are also committed to ensuring the continued professionalism of the reviewers, that they are real experts in the subjects and contents that they review. They also strive to update the list of reviewers available, using a wide range of sources to discover potentially new reviewers (personal contacts, authors, bibliographic databases…). Comunicacion y Hombre is committed to promoting the encounter between different researchers that seek to find meaning in communication, beyond what is purely useful and “immediatus” (without media), to dote it with its other “use”, in which the media act as “medius” and not as an end in themselves, transcending both in journalism, advertising, audiovisual creation and artistic creation, towards the concept of communication as a meeting point of creation, of an authentic communion. The articles will be selected and accepted based on their academic merit, research rigour and originality. The journal “Comunicación y Hombre” employs a peer double-blind review system, guaranteeing objectivity and confidentiality in the selection process as well as anonymity, both during the communication of suggested impovements to final admission. The reviewers are committed to maintaining the confidentiality of the articles. The director undertakes to maintain the identity of the reviewers anonymous. In this way, impartiality in the article selection process is ensured. The reviewers are committed to expressing their opinions and suggested changes, if deemed appropriate, in a clear and reasoned manner. The reviewers must detect and warn of any article that is substantially similar to other already published. The articles will be written with objectivity and in search of the truth and any academic opinions will always be identified as such. The authors guarantee that the research results presented are original and have not been published or not in a review process for publication in any other publications. In the case that parts of a text have previously been published by the author or another author, said parts must be clearly cited. The authors, where necessary, will always ask for the necessary permission for reproduction of content from said sources. The authors undertake to modify and improve their articles if asked to do so by the reviewers, and to follow the suggestions regarding keywords to facilitate the search for articles. The authors must promptly advise of any significant error detected in the publication and collaborate in the publication of the error, where necessary. “Comunicación y Hombre” considers it a fraud and unethical conduct to plagiarise or falsify information for the confirmation of hypotheses. Any breach of authenticity of texts, usurpation of authorship and distortion of the originality of the texts will also be deemed unethical. Unethical conduct is also that in which authors publish material for interests other than the search for knowledge and the truth, such as monetary gain or aid for research or to obtain academic recognition points in order to comply with the quality evaluation criteria of agencies in order to obtain accreditation. It is also considered unethical any adherence to such maxims as “publish or perish”, which converts the researcher into a mere seeker of points, the research itself being relegated to a bureaucratic procedure, far from its true and pure objective of seeking knowledge and understanding. Self-plagiarism is also considered to be unethical conduct, if what is published is the same research with minor changes made for the sake of publishing in various journals with the sole aim of increasing the number of publications. The journal “Comunicación y Hombre” reserves the right to denounce and prevent any unethical conduct. All of the agents involved in the production of this journal are obliged to report of any such unethical conduct and to contribute the necessary data, information and evidence for subsequent inquiries. Each case will be assessed with utmost seriousness and total impartiality by the agents involved, in order for the correct decision to be then taken. The evidence will be collected, avoiding that any accusations are disclosed to anybody not involved in the matter. “Comunicación y Hombre” will reject all articles that, in contrary to our code of ethics, is deemed the product of fraud or plagiarism.